What is a lead generation website and why do we like them so much for local businesses? The answer is very simple. Lead generation websites work! Tell the viewer what the business sells or does. Give the viewer a reason to call or contact the business. Provide contact information quickly and easily. Notice that none of the above includes things like “impress the visitor,” “amuse the visitor,” “entertain the visitor” or “stun the visitor with their beauty.” There are plenty of fluffy and artistic websites out there that never rank well or make one single dime for their owners. The local lead generation website is a hard working internet asset used for one thing only – to get sales! Why do we like lead generation websites so much for local business? Because they work! And, because of the care we take in designing the part of the lead generation website that only search engines see, many of our clients have had fabulous success ranking well on Google for their business niche as well! A lead generation website is NOT a work of art. They’re crisp, professionally-designed local lead machines designed exclusively to generate sales – and to be found by search engines. If you are looking for beauty, dramatic images and graphics, flash animation and a quirky but “lovable” design – we can’t provide that for you. In fact many website designers turn their noses up at the mere thought of a basic website without fancy graphics, fancy layouts and exotic animations! Why is that? Most website designers would rather charge you $3,000, $5,000 – even $10,000 for a business website! We only change a fraction of that for a nice looking, great performing local lead generation website. Get Your Business Noticed Now! Local lead generation website are incredibly effective at being a great “hub” of your online presence, helping your business get “noticed” by search engines and attracting clients and customers to your business to buy your products and services. If you keep asking why your current business website isn’t doing anything positive for your business – maybe it’s time to look into a local lead generation website? 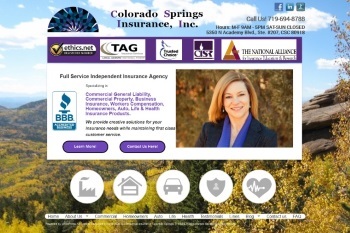 If you like what you’ve read and want to stop wasting time with your dead and unresponsive website, why not give us a call at 719-761-4862 to discuss the options of getting your business noticed. Or you can contact us HERE. We offer a virtual smorgasbord of options such as blogs, video sharing, lead generation and more. We can host & maintain your website, or we can show you how to maintain and update your website. We also offer social media setup/maintenance, search engine optimization (SEO), and reputation marketing to help establish your business in your local community. We specialize in WordPress, the No. 1-ranked CMS. It makes maintaining your website easy. Plus, WordPress is great for SEO, and we love building sites that are appealing to the search engines. Addition of custom content – text, images, videos, etc. To get started, please contact us using the form below or give us a call at 719-761-4862. Have you purchased a domain yet? Will you have content & images? Will you be selling items or services online? Would you consider a "themed" design to save money? Do you have graphics & a logo? Please tell us any other thoughts or relevant information that will help us serve you better.